Would you kindly please explain why you replace Dishong.classic for this newer version? For so long she was noted on Roberdeau's map as being next to Karan Westbrook, but we know that is not right. Dishong's same day journal entry indicates she wore a jacket to the parade, and then latter removed it. The Cabluck photo shows that jacket hanging from her left arm. Your Dishong.new is wearing a long coat. Here is Don's announcement on alt.conspiracy.jfk some 15 years ago. IIRC, I did some googling about a year ago and found on a genealogy website (or a people-finder website or some-such thing) an "Inez Juanita Hart Dishong, born about 1909" who was living in, or had lived in, Irving, Texas (she died in 1998 and would have been around 53 years old at the time of the assassination). You can probably find a link to that source and/or the info contained therein in a post I made at the time at the EF. Another thing that "factored in" was that, after I'd convinced myself and a few others at the EF that the traditional (dark-complected) "Gloria Calvary" (sic) in Robin Unger's Z-frame and in Don Roberdeau's map must have been self-described American Indian Stella Mae Jacob, instead, Sandy Larsen and I started wondering where the real Gloria Calvery was in the Z-film, and tentatively concluded that the group of four Southwestern Publishing Company colleagues who claimed in their FBI statements to have watched the motorcade together on Elm Street -- Calvery, Hicks, Reed, and Westbrook -- probably comprised the group of four headscarf-wearing women in Zapruder, and since that seemed to be the case, especially after our spoting in Couch-Darnell a black-blouse and black-headscarf-wearing woman at the TSBD steps about 25 seconds after the final shot, who was in very close proximity to a woman on the steps wearing a white dress and a white headscarf, led me to ... gasp ... speculate that "June" Dishong, who worked at a garment factory a few blocks away and who, according to Westbrook's FBI statement, apparently watched the motorcade with said Southwestern Publishing group, may have decided to "follow suit" and wear her headscarf, too. 2) Using hardhat A. J. Millican and blond journalist Mary Woodward in Altgens-6 and in Zapruder as "landmarks," it's easy to see that the far left edge of un-cropped Altgens-6 (where My Dishong is standing after having waved at JFK about three seconds earlier) seems to end right where the line of four headscarf-wearing women I've been talking about, above, begins in Zapruder. As you can see, there's a terrible, terrible, terrible amount of highly verboten intuiting and speculating (detective-like thinking?) on my part, but IMHO, the woman at the far left of un-cropped Altgens-6 looks to me as though she could be a 53 year-old Hispanic (or half-Hispanic) woman, and she's in exactly the right place to have watched the motorcade with the just "off stage left" four-member Southwest Publishing group that's so easy to see in Zapruder, and she is ... gasp ... wearing a headscarf, just like the other members of that apparently "group cohesiveness"-conscious (or unconscious -- LOL) group. 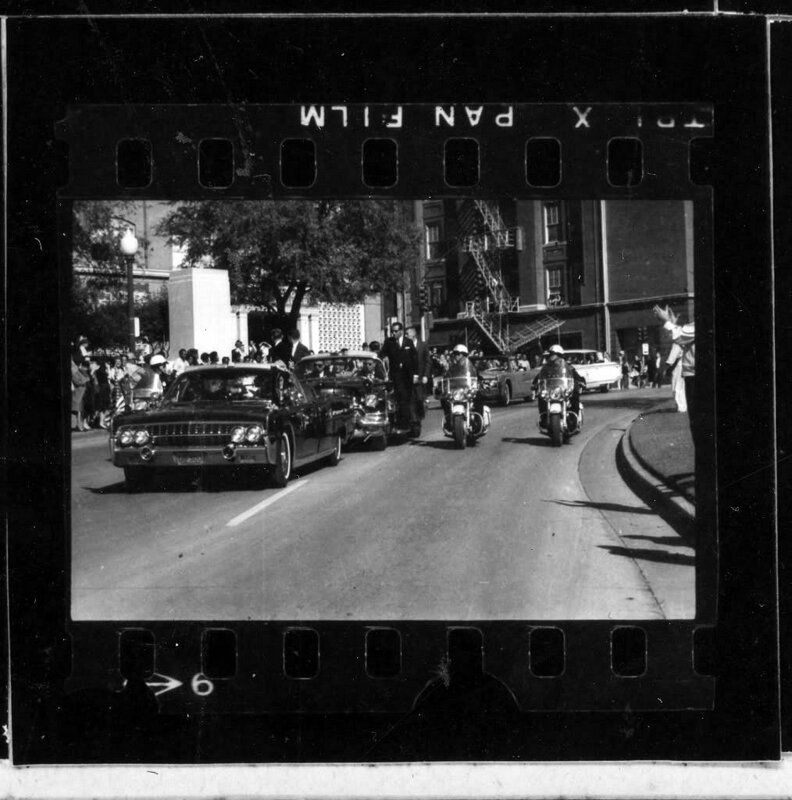 For purposes of cross referencing the people in this photo (Altgens-6) with those in the Zapruder film, let it be noted that we can see hard hat-wearing A. J. Millican and some of the people around him in both (e.g., journalist Mary Woodward https://www.jfk.org/oral-history-project-memory-2017/mary-woodward-circled/ ). In the Z-film there seems to be a woman in a blue raincoat who is pretty much hidden between Unger's-Roberdau's Maggie Brown (correct) and "Jane Berry" (wrong), which woman's head can also be (barely) seen wearing a light-colored headscarf in Betzner-3 and Willis-5, just like my little ol' "June" Dishong is wearing in full-frame Altgens-6, right there at the beginning of the ("off stage left") Southwestern Publishing Company contingent. Edited a bit and bumped. Do you have any evidence how tall Dishong actually was? Shall I have here exhumed and measured for you? Why bother when you can just determine height based on a Hispanic name? Among the Many questions surrounding this Altgens Photo is the Gent in the Hat pictured above the woman being discussed. This guy for whatever reason is Not close to facing/looking at the JFK Limo. The man has been alleged to be sitting on top of a short wall, but in order for this to be true he would have to be situated atop the wall as if he were riding a horse. Or possibly American Indian, from New Mexico Minnesota? PS Now that the "official," really really really "set-in-stone" position of Westbrook has been switched four spaces to the right with her 2017 Sixth Floor Museum interview with Stephen "Smilin' and Noddin'" Fagin, with whom do you believe Dishong is standing (on her left) in Unger's largely xxxxed-up Z-frame? Gasp ... Maybe the mastermind of the whole "operation"?